The durian is a Southeast Asian fruit that is by many people across Asia considered “the king of fruits.” Its meat is often described as delicious. It is also considered in many places to be an aphrodisiac (the Encyclopedia of Food claims that both the Chinese and Malays consider it so, citing a Malay saying “when the durian falls, the sarong falls”). But along with these unobjectionable features, the durian are also known for a highly objectionable, “fetid” smell. If this weren’t enough, the fruit is covered in sharp spines. It looks like a grotesquely overgrown cousin of the horse chestnut. The smell of the durian has been likened to that of a dead animal in putrefaction, rotting trash, and stale vomit. Many people, perhaps a majority, report this impression, and in fact durians are banned in some places, their smell is considered so offensive. Not everyone finds the smell offensive, and many of those who do learn to love the taste of durians anyway. I purchased my first durian at New Golden Sparkling this weekend, and I was surprised to find that I could not detect a putrescent odor from it at all. It smelled merely sweet and a little overripe. I have since learned that there is a small minority of people who do not perceive a rotten smell from durians. The writers of Wikipedia’s article on the durian, wise souls, opine that we are better able to distinguish the harmless ketones and aldehydes in durians from those in putrescent garbage than other people are. 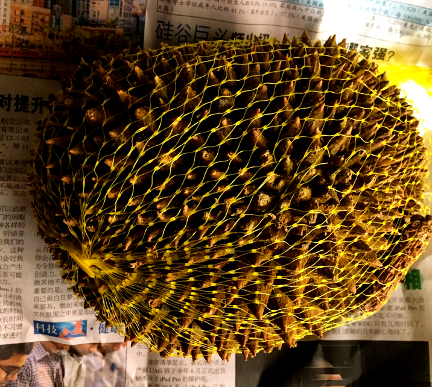 The other surprise was that the durian’s visual unpleasantness does not end with the spikey exterior. When I pulled the shell of the durian open, a yellowish tube of meat limply rolled out like a dying grub. Had some giant maggot found its way into my durian? No, the dying grub was the famously delicious meat of the durian. The durian is prized across Southeast Asia for its flavor; an early Western taster said this of the durian: “as producing a food of the most exquisite flavour it is unsurpassed.” A person’s esteem for the durian only seems to grow with time, in fact–although the person’s revulsion at the smell may not. My impression: It has the consistency of custard, and a lightly sweet, complex flavor. And, within the spikey exterior there is a maggot-like piece of meat that is as appetizing as a maggot can be. Is its exquisiteness unsurpassed? I cannot say, but it is certainly worth a try. Bhutanese cuisine also largely avoids the shadow of Tibet. In Tibet, the staple crop is barley, forming the major ingredient in tsampa, which is eaten daily by most Tibetans. In Bhutan red rice—a variety of rice that can be grown at high altitudes—is a staple. While the Tibetans like their food spicy, the Bhutanese are famed for taking their food fiery hot, chilies often being regarded as a suitable main dish–seemingly a fitting cuisine for the land of the Thunder Dragon. 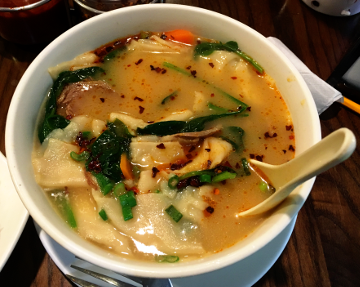 It may be that the world is not yet ready for the heat of Bhutanese cooking, or it may simply be that the Bhutanese are too happy where they are to bring us their cooking; in any case, it is not easy to find Bhutanese food in the United States. Walk ten minutes westward on Roosevelt Avenue—away from the clamor of Jackson Heights—and then a few blocks south, and you will find yourself in seemingly remote Woodside. A few hundred years ago, in Ngawang Namgyal’s time, Woodside was known as a snake-infested swamp (referred to as “suicide’s paradise”). Today . . . well, in my view Woodside has not really met its potential yet. But I have not encountered any snakes here, nor can it be called a swamp except perhaps on especially humid days. 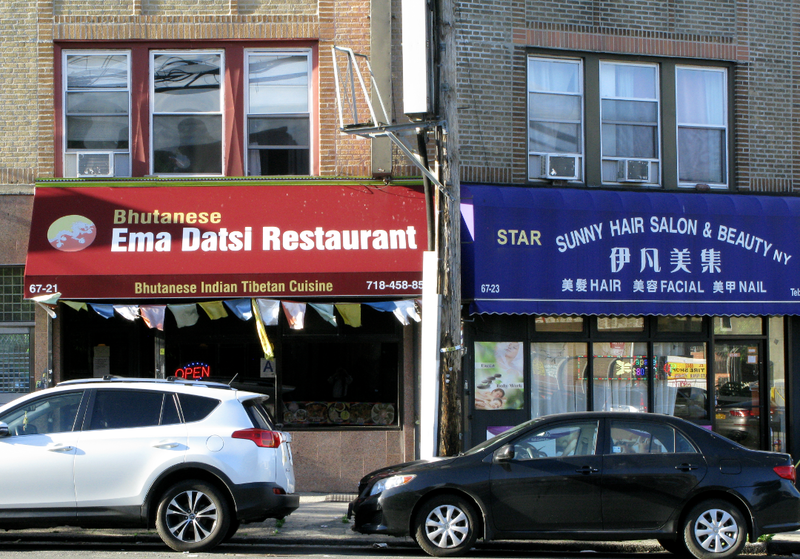 In a row of neighborhood storefronts facing a freeway, you will find Ema Datsi. The restaurant is named for a popular dish in Bhutan (often called the national dish). The dish consists entirely of fried chilies smothered in cheese. The restaurant is a little dark. The eastern wall is covered in posters celebrating Bhutan. There is a small shrine on the north wall, with a picture of the Dalai Lama and another lama who I did not recognize. I ordered ema datsi and a Tibetan dish, gyuma—blood sausages stuffed with tsampa. The owner of the shop brought me a formidably large dish of ema datsi along with a soup—very similar to miso—that he said would help me to cool my tongue when the chilies got to be too much. With the sausages he brought chili sauce. Ema datsi is really a simple dish, and if you like chilies, you will like ema datsi. An entire dish of ema datsi becomes a little hard on the stomach, however. The owner, perhaps unpatriotically, suggested that a meat dish would be a better choice for a meal. If you have ever tried tsampa, you might be surprised by the gyuma. 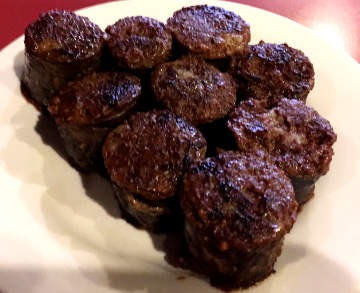 I could not identify a tsampa taste—instead gyuma was just a very mellow, soft sausage. The Tibetan butter tea was some of the best I’ve had in Queens I do not think there was any milk in it—just butter, and maybe even real brick tea. What about the customers? Tibetans, Bhutanese, and Nepalese, he said. 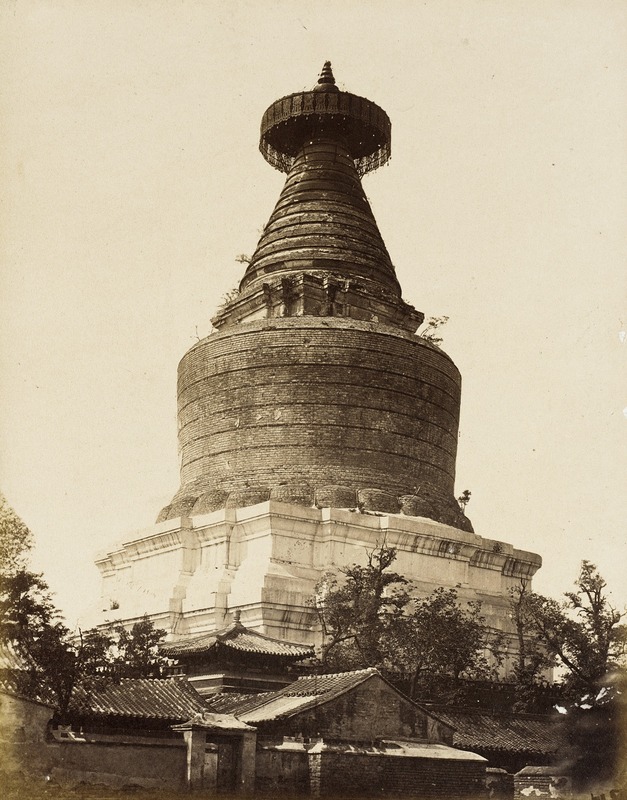 He estimates that there are two or three thousand Bhutanese in New York. Then our conversation turned to rent, a subject on which he had much to say—and I knew that he had become a real New Yorker. 1. Most of this can be found in Karma Phuntsho’s History of Bhutan. A party of monks sat at a table at Laliguras, wearing red sneakers to match their red robes. I faced away from them at the window, looking at an old McDonald’s across the street. I wondered if there were momos on the McDonald’s menu yet, this being Jackson Heights, where, I suspect, many people live entirely on momos. 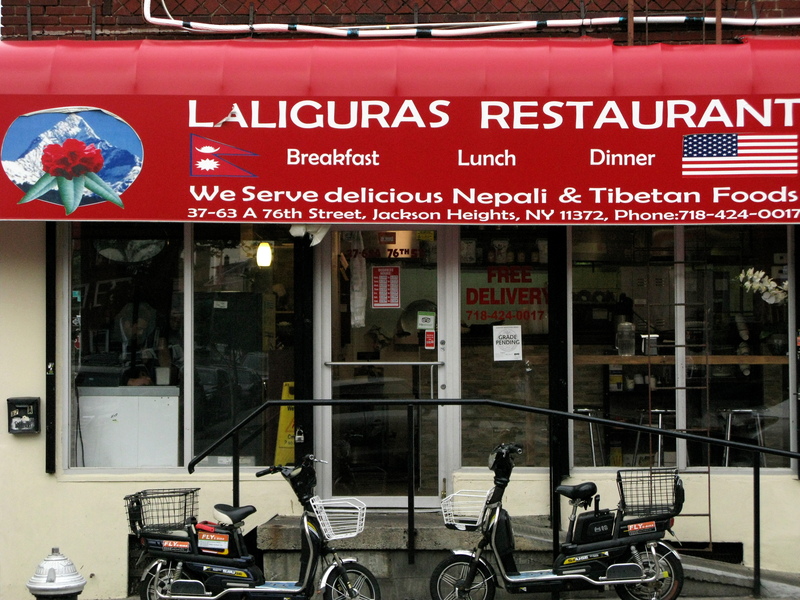 To my delight, however, Laliguras (a Nepalese restaurant) features several interesting dishes that are far from momos, and are, in fact, far from anything Tibetan. Some of them are Newar. I ordered one of these, Bhutan Samayabajee. Miaoyang Temple in Beijing, designed by the famous Newar architect Araniko in the Yuan dynasty. Felice A. Beato (Italy, 1825-1908). But while the Newars were renowned throughout the region for their crafts, the majority of them have historically been farmers. Newar farmers typically take baji, a midday snack, out into the fields with them to eat.3 But baji has become a part of larger feasts. Bhutan Samayabajee is a spread of several different dishes, which can vary, but include baji. 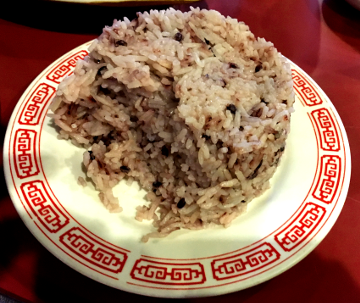 One of the essential items is chyura, or beaten rice. It consists of dry flakes of rice. It is reminiscent of American breakfast cereal, and seems to call for milk. I wanted to ask my waitress if I was supposed to combine it with something (like milk), but she was busy with her monks, so I just ate it plain. Another item is roasted, spicy soybeans, which are also very dry. There was one more spiced bean that I was unable to identify. Altogether, the beaten rice and dry beans were a bit like trail mix, and I could imagine taking them out into the field on plowing day. This is very different from anything I have encountered in Tibetan cuisine, and I imagined the Tibetan monks sitting behind me watching me eat my dry rice flakes and roasted soybeans with pure horror. There was, however, one item on the plate that would likely have suited Tibetan tastes just fine: fried-goat head. This was identified on the menu as “Bhutan,” which was what initially attracted my attention—was this Samayabajee from the kingdom of Bhutan? 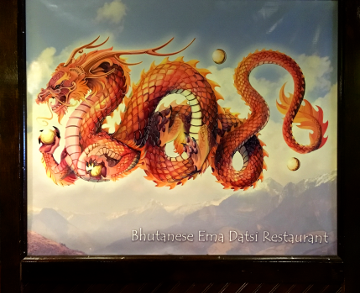 No, according to the waitress, “Bhutan” means goat-head in some language or other. She was quite sure that the meat was from the head of a goat, in any case. It was fatty and delicious. On the side, perhaps conscious of the monks behind me, I ordered Tibetan Tingmo, which are large doughy rolls—very high in carbohydrates, and thus very pleasing. One of the staples of samayabajee, along with beaten rice, is choila, spicy fried meat served cold. It is often dried, and at Laliguras it is very chewy. 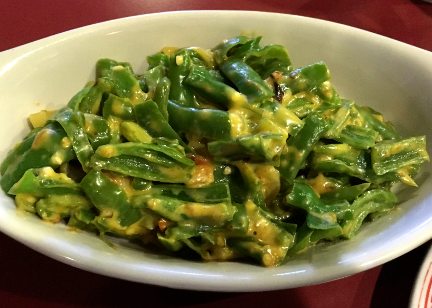 At Laliguras you can order a larger serving of choila as a side dish. It is slathered in spicy sauce, but it is tough, sometimes almost as tough as jerky. I also got a serving of steamed momos to go with my choila. Quite good. Elmhurst, like most other neighborhoods in Queens, has a large Filipino population (this morning I noted a flyer seeking a roommate with the stipulation “Pinay only” in a laundromat near my apartment) and you often hear Tagalog spoken on the street. But in local stores, you may hear a language that sounds similar to Tagalog, but that is actually a relative—Indonesian. Both belong to the Austronesian family, a language group that spans much of Southeast Asia, from New Zealand to Taiwan (where the greatest diversity of Austronesian languages exist), with satellites in Madagascar and the Easter Islands. 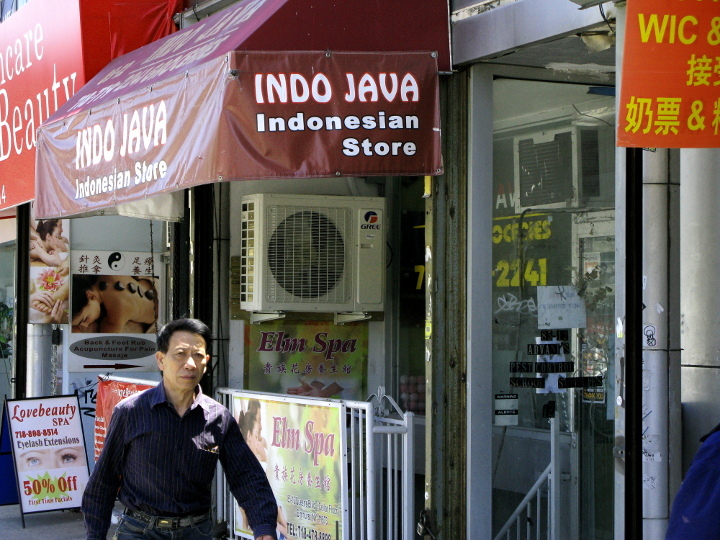 There are several thousand immigrants from Indonesia in New York, and probably the greatest concentration of them lies in Elmhurst. One of the country’s famous Indonesian restaurants, Upi Jaya, is in Elmhurst. And, naturally, there are some Indonesian grocers in the neighborhood. As a diner I am working my way toward Elmhurst, but I decided to try cooking from one of these grocers today. 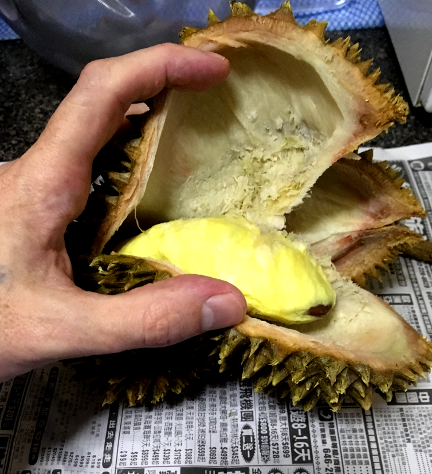 My greatest hope was to find a durian, a fruit that is noted for its supposedly delectable taste and putrescent odor and that is popular in Indonesia. But short of that, I at least hoped to find the ingredients for a stir fry. 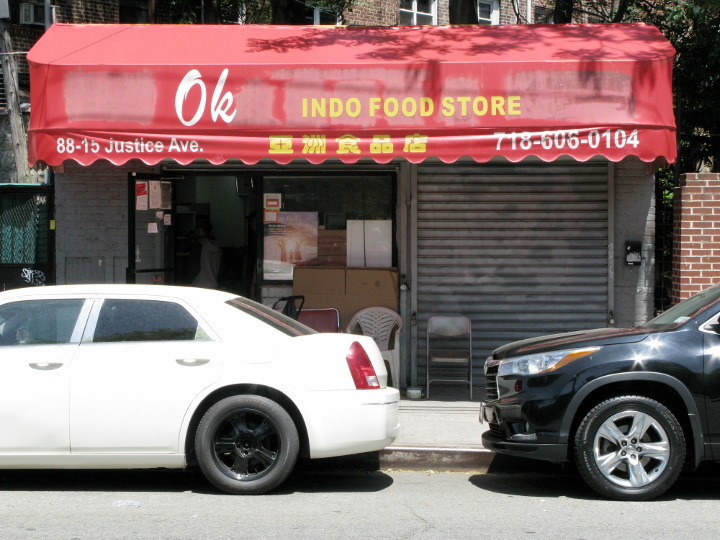 I tried two stores, Indo Java and OK Indo Food Store, and neither had any fruit at all—they both sold only spices. Probably most other ingredients can be found at New Golden Sparkling, along with foodstuffs from everywhere in East Asia, so these Indonesian grocers dedicate their scarce shelf space to hard-to-find spices. I had not really done my homework for the stir fry. I don’t know anyone who would be likely to have good Indonesian recipes, and I don’t have any Indonesian cookbooks. So I asked the fellow at the store. 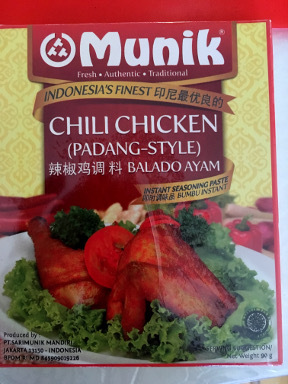 He handed me a packet of Padang-style Balado Ayam, an Indonesian instant seasoning. This was followed by a trip to New Golden Sparkling for vegetables. 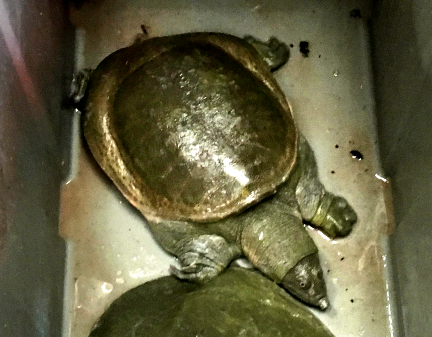 New Golden Sparkling had turtles today, and I’ve updated my older post with a photograph. 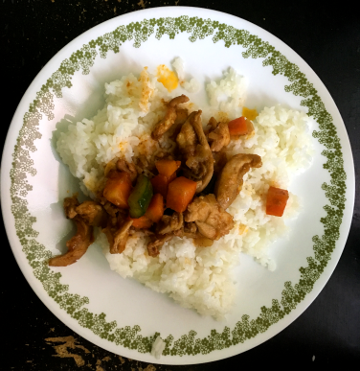 I diced by vegetables and peppers, sliced my chicken, added sesame oil, and fried. Then I added soy sauce and this Balado Ayam. The result had a surprising tangy flavor under the considerable spicy bite. I suspect there was a good deal of tamarind in the Balado Ayam. There were also many mellower spices at work. It may not compare to Upi Jaya, but it was very good. 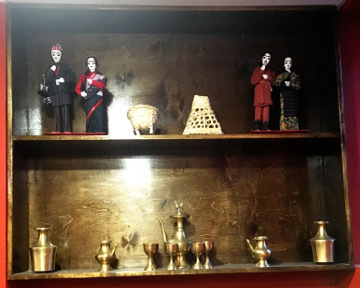 Phayul does not try to impress with Tibet-themed décor. There is no décor—save for the plants in the windowsills. Phayul seems to celebrate the precious little space it has by keeping it clear and uncluttered. And indeed, despite the fact that the tiny kitchen shares the room with the five or six dining tables (being separated only by a counter), Phayul feels open and airy, with evening light streaming through the windows. 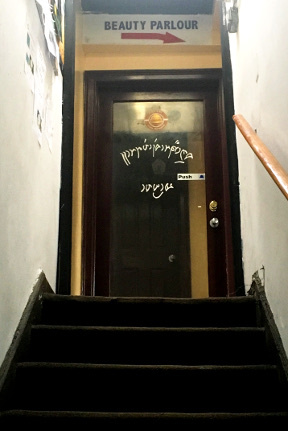 It is on the second floor, and the windows overlook the busy pedestrian mall beneath (yes, you must find the doorway tucked away between storefronts and climb a flight of stairs to find the restaurant). 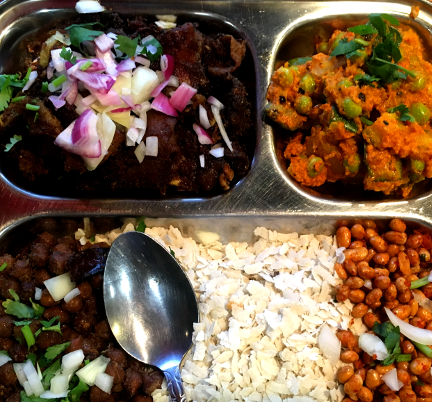 The menu here is more tightly focused than the menu at Himalayan Yak a few blocks away. This is Tibetan food. 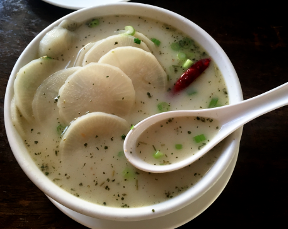 I had read that some of the dishes are from Kham and some from Amdo and other regions of Tibet; the menu does not identify dishes by region, but I ordered a soup (tsak sha la kor) that I had read is from Kham. (I asked the owner of the shop if this was true. “The herbs are from the mountains in Tibet, yes. Mountain herbs. The daikon also is from Tibet.” The answer, if not what I was looking for, was interesting.) I also, of course, ordered momos (but this time fried). The soup came first. It tasted much as it looked, creamy with an herbal flavor; but it had a wonderfully warming spicy kick. Under the mountain of daikons at the top, hunks of bone and rough-cut meat steeped in the broth. 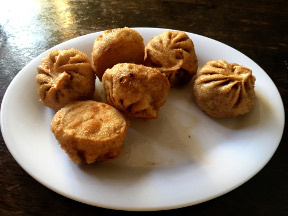 The momos, when they came, were a surprise to me: they had been deep fried, and their shells crumbled as I bit into them. The meat within was richly flavored with onion and peppers. The owner encouraged me to dip them in a mixture of hot sauces and soysauce. “But only a little!” she added gravely. “Be careful” Indeed, I was soon weeping over my meal. Where Himalayan Yak had served several large parties and many couples out for a date, Phayul seemed to attract more casual diners, almost all of them Tibetan. A couple of young Tibetan men followed me into the restaurant, chatted with the cooks briefly (three women and one man, all middle aged Tibetans), then ate quickly and left. There were several more groups of young Tibetans, as well as a couple of small families. The restaurant does not seem to need patronage from outsiders like me. 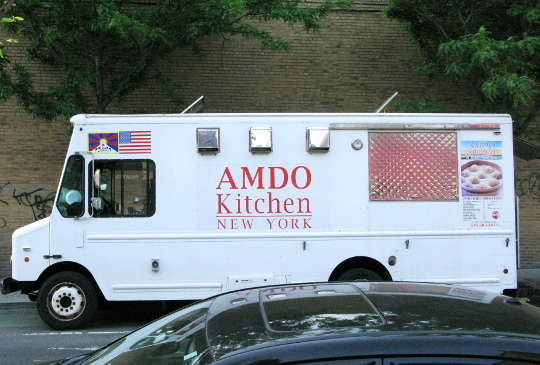 Through the window, I could see a Tibetan food truck named Amdo Food Kitchen—clearly aiming for someone who could readily distinguish Amdo cuisine from Kham cuisine. Evidently, there are enough prosperous Tibetans in this area to support a lively culinary scene. The Tibetan Butter Tea, like everything else at Phayul, favored substance over appearances. It was handed to me in a paper cup. Tonight I returned and tried the chele katsa—apparently one of Phayul’s most popular dishes. 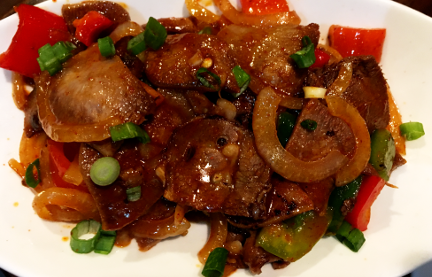 Chele katsa is sliced beef tongue fried in green and red peppers, spring onions, garlic, and chilies. The meat is flavorful, and combines perfectly with the peppers. I also tried the thenthuk. This is a soup with pulled noodles (flat and wide), boiled beef, and spinach. It is surprisingly mild, but the waitress hesitatingly suggested adding chili sauce (“it is very hot,” she said, with knitted brows). The soup came to life. Phayul was busy tonight, and there were people waiting by the door for a table nearly the whole time I was there. The food is good at any hour, but I recommend going early when you can enjoy the space to yourself and when the sunlight fills the windows. One cannot avoid Jackson Diner. It was a discovery for the foodies of Manhattan once; now it is an essential part of the New Yorker’s dining curriculum, like Katz’s Deli or the Russian Tea Room. So I went, half hoping the food would be terrible so that I could be a contrarian about it. Of course, I had reason to suspect that the food might be overrated. 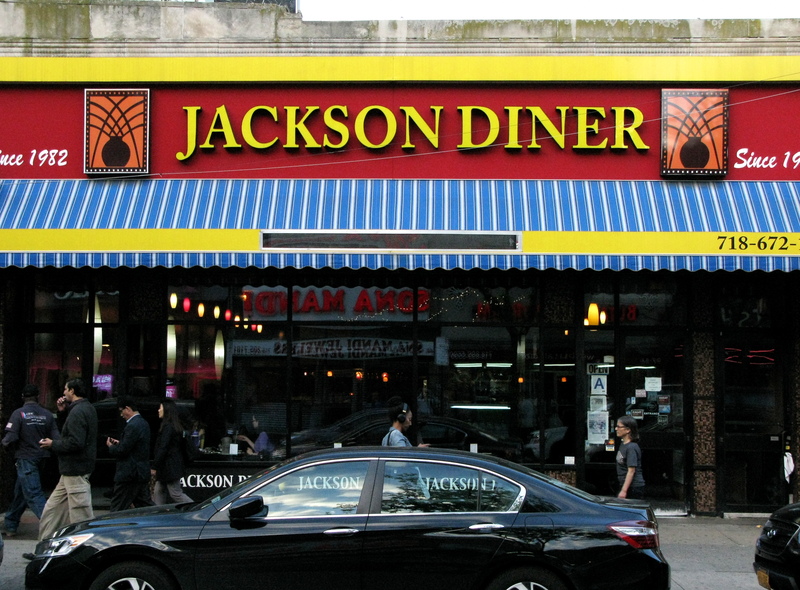 Jackson Diner owes much of its fame to being one of the first arrivals on the scene. 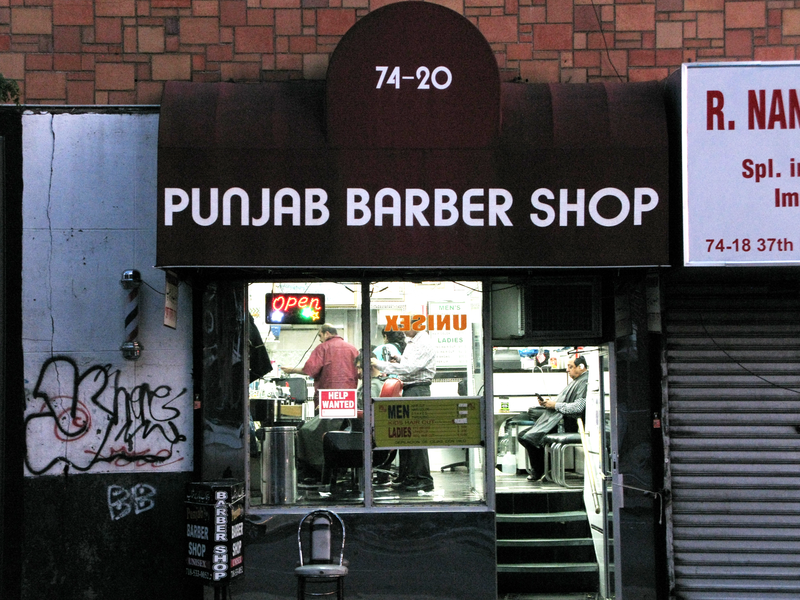 It opened in the early 1980s, a time when Archie Bunker would still have felt at home in Jackson Heights and the Queens Indian community was just beginning to blossom. I ordered tandoori chicken and nan. It has been said that Jackson Diner has the best samosas in New York, but I am on a budget, and Jackson Diner is not quite cheap, so I forewent appetizers for tonight. The chicken came out sizzling and popping, dark red, and seared black around the bone. When I pulled a drumstick open, the meat within was almost white. It promised to be dry and flavorless, like bad turkey, but in fact it was tender and infused with cumin and coriander—just slightly spicy. The nan was soft and buttery and irresistible. It has been said that Jackson Diner is not quite authentic: they have made their dishes less spicy than the equivalents in Punjab or U.P. might be. I am not sure. I will say that when I use an Indian friend’s recipe* for curried chickpeas, my hands burn with spices for days after, and I must be very careful not to touch my face while cooking. On the other hand, that recipe calls for chilies, and most Indian dishes I know of use chilies, potatoes, yams, or one of the numerous other items that were introduced to India in historically recent times—so perhaps innovation is not strictly at odds with authenticity. 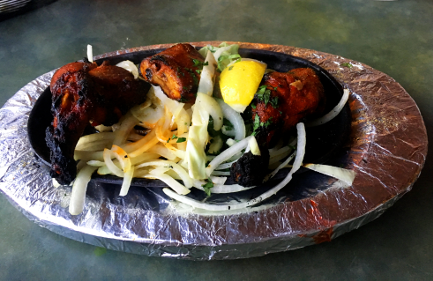 You may also enjoy contemplating, as you savor your tandoori chicken at Jackson Diner, the history of the tandoor itself. The tandoor is a vertical oven, often a clay cylinder, that cooks at very high temperatures. 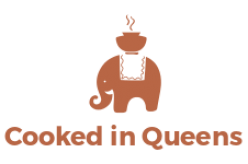 Tandoor ovens have supposedly been discovered at Mohenjodaro**, one of the Indus Valley Civilization cities (in present-day Pakistan) dating back to the third millennium BC. *Shu is the ancient name for Sichuan, from the Warring States period—when it was an independent kingdom (one that probably did not speak a Sino-Tibetan language). The line from the Li Bo poem captures my trepidation at attempting Sichuan-style cooking. The region’s cuisine is of course famous, and one might imagine it’s as hard to master as the mountain passes that lead to Chengdu. But my wallet needs a rest, and I wanted to keep exploring local ethnic eating options, so I decided to spend some time at New Golden Sparkling Inc, the local Chinese grocery, and put together a Sichuan-style stir fry. 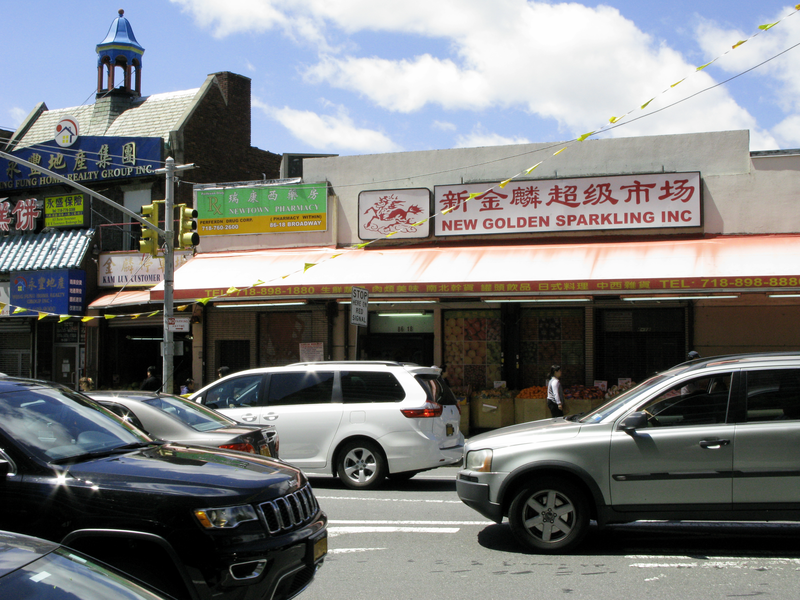 Despite the frankly noxious smells that often radiate from New Golden Sparkling Inc, especially late in the day, the store is very popular with locals. It is large, and has foodstuffs from all over China, Taiwan, and Japan. 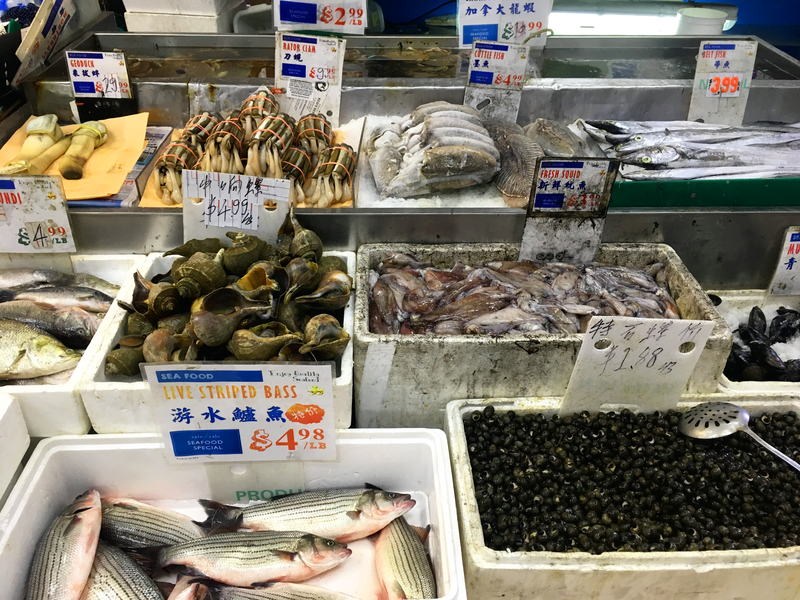 In addition to fresh seafood (augmented with live frogs and sometimes soft-shell turtles), they have a wide selection of fresh mushrooms and other fungi, seaweeds and jellyfish, and even Hell Bank Notes and other aids for sending loved ones to the after-world. I also picked up a chilies, carrot, an Indian cucumber, and onion to add to the mix. 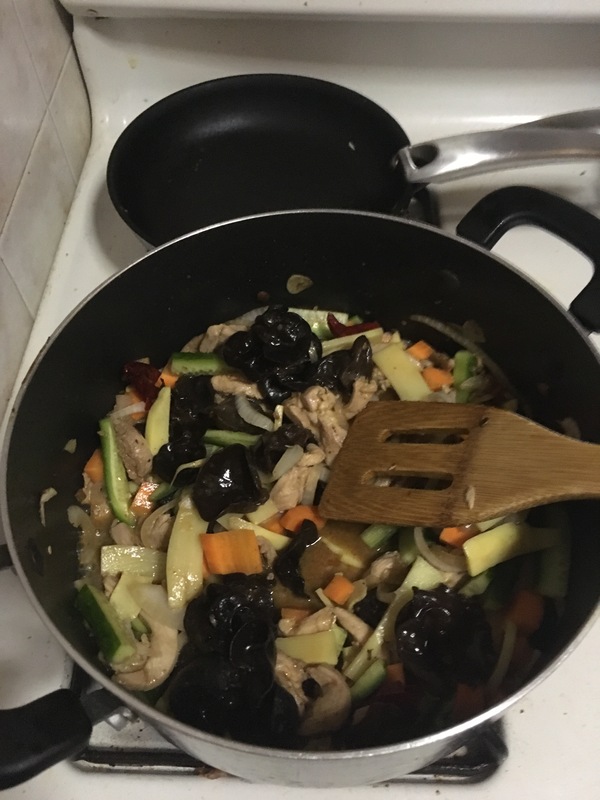 The first step in preparation was to mix a marinade with the Shaoxing wine, some soy sauce, and flour with a pinch of salt. Then slice and marinate the chicken, at the same time soaking the wood ear fungus. Then dice your veggies. Heat up some oil, preferably in a wok, though I just used a non-sticking pot, and start frying the chicken, onion, garlic, and ginger. Fry for several minutes, then add the wood ear fungus and vegetables. Keep frying until the chicken is done. The result was quite tasty. 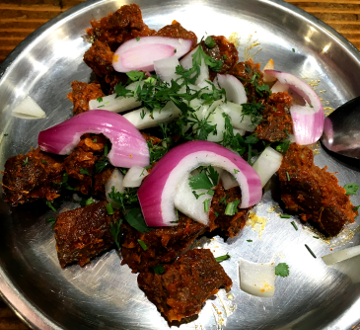 Many writers on Yelp describe their visits to Himalayan Yak as departures from the usual, Nepalese and Tibetan food not having penetrated American culture the way Indian and Chinese food have. But after a short walk around the stretch of Roosevelt Avenue between 72nd and 74th Streets, the Wendy’s down the block will seem more unusual than Himalayan Yak. 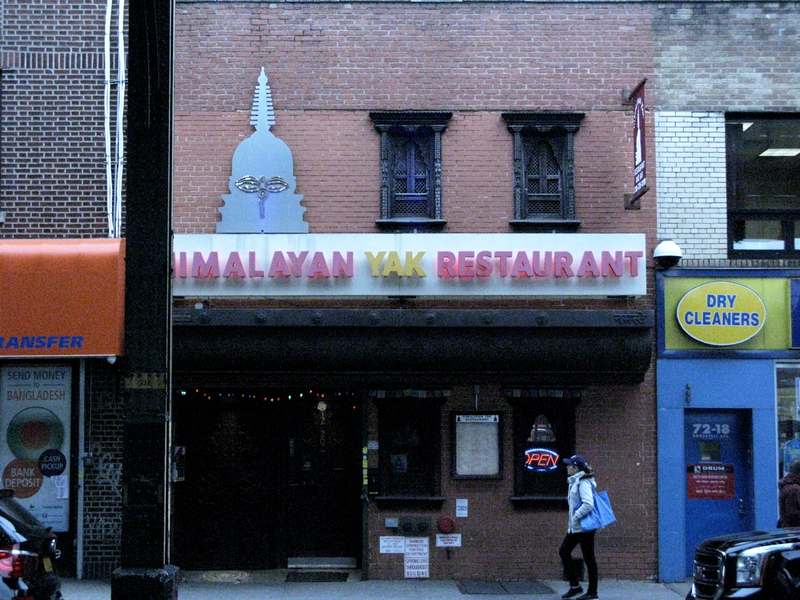 Most conspicuously, a Tibetan restaurant faces Himalayan Yak from across the street in what must be an interesting rivalry. There are also two trucks selling Tibetan momo on this block. There is even a Tibetan hairstylist a few doors down, not to mention the two Tibetan shops awaiting you in the bowels of the 73rd Street subway entrance. The menu here is large, with Nepalese, Tibetan, and Indian sections. I ordered yak momos. I would have been very impressed if they had found a way to spoil momos, but the yak meat was something of a variable for me—and it was delicious. As promised by many a Yelp reviewer, the restaurant has interesting décor. I faced a mask—I think portraying Padmasambhava, complete with an offering scarf (khata) draped over it. An elaborate arrangement of Buddhas was portrayed in metalwork hanging on the wall, echoing another arrangement of Buddhas carved into a large wooden panel hanging over a table. Toward the back, a photograph of the Dalai Lama occupied the place of honor in an elaborately carved wood panel. The highlight of my meal was a cup of Tibetan cha (tea) that I ordered after dinner. “Have you had it before?” the bartender asked me, doubtfully. I had. I took an immediate liking to it, unlike every other westerner I met, when I frequented Tibetan shops in Nepal and India many years ago. If you have never tried it, it is made with milk, butter, and quite a bit of salt. I expected a tiny cup of the stuff, the way I remembered getting it in Nepal. Instead the bartender brought me a large mug. The cha was milkier than I remember cha in Nepal and India being, but it still had that very surprising salty bite. I drank the whole cup. The restaurant has been open for twelve years and was quite busy tonight, so they do not seem to have anything to fear from the Tibetan rival across the street. That said, I hope to try that Tibetan rival soon. Stay tuned. I went again and ordered phapar ko dhendo. 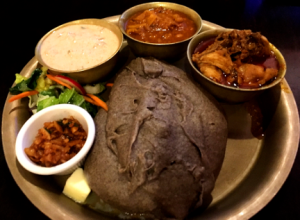 This is essentially the same dish I ordered at Mustang Thakali Kitchen, consisting of a great mass of buckwheat dough with spicy side dishes arrayed around it. The dishes included curried chicken, fermented bamboo shoots, spicy yogurt, and radish. I asked the bartender if she ate this where she comes from. Our discussion of foods incidentally threw some light on class in Nepal. She explained that she also did not eat samaybajee because it’s Newar food. To me, Newar denotes an ethnolinguistic group, but that is not how she explained it. I did not ask her what her caste was. But I heard her addressing a customer as hajur (हजुर—at least, I think . . . I know about three Nepali words), which I have read is used by Brahmins and Chhetris (Kshatryas). So perhaps, given also that her explanation of castes began with Kshatryas, she is a Kshatrya. In any case, Newar food is almost as foreign to her as it is to me. The dhendo was very good, though the bartender was probably right to make sure I understood what I was ordering before sending the order to the kitchen. 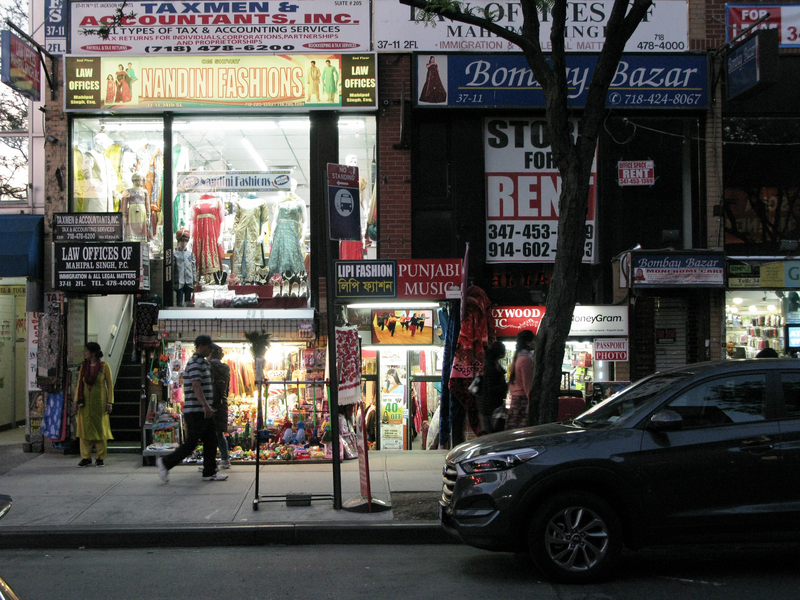 The natural starting point for my exploration was the Jackson Heights-Roosevelt Avenue subway station, which is surrounded by brightly lit shops selling Indian and Middle Eastern groceries, Tibetan and Nepalese restaurants, Halal restaurants, Indians restaurants, and much more. 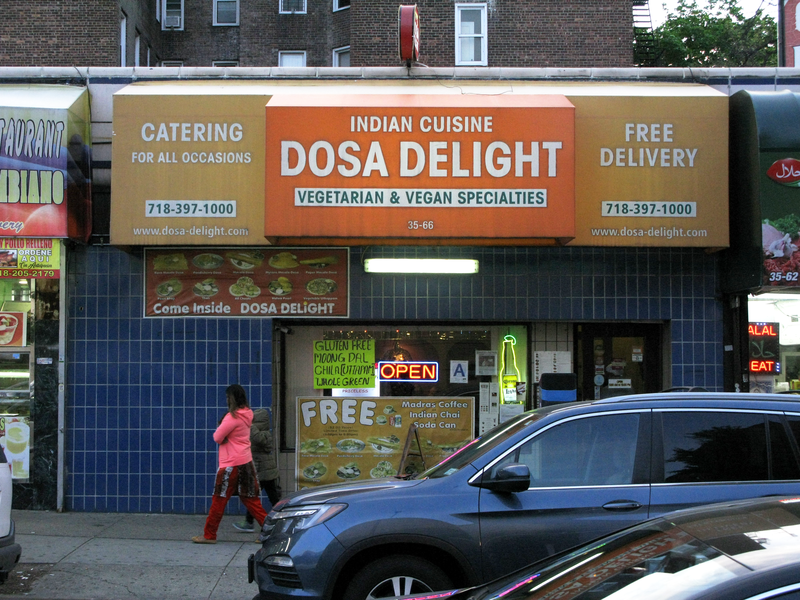 About two blocks north of the station, near a Bangladeshi shopping mart and an Indian sweets store, I found Dosa Delight, which had been recommended to me by a foodie friend. It has a modest storefront, looking a little like a laundromat, and would have been easy to miss if I had not been looking for it. A sign by the front door informs us that the food is “diabetic friendly,” and describes the health benefits of vegetarian food. Within, the dining area is on the small side and slightly claustrophobic, with little space between tables and little to look at besides other diners. Happily, there were plenty of diners. Many of them seemed to be locals, some of them eating alone. 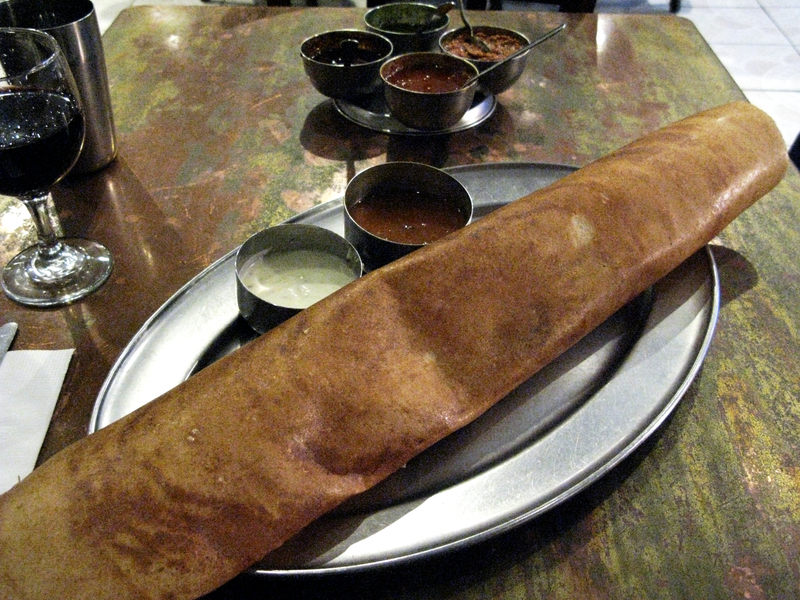 The menu consists of South Indian foods (all vegetarian), featuring prominently–you guessed it–dosas! If you haven’t had them, dosas are thin, light pancakes made from a mixture of ground rice and lentils. Apparently, they have been mentioned in ancient Tamil texts, so they have a venerable history. The dosa was slightly crisp but still soft. 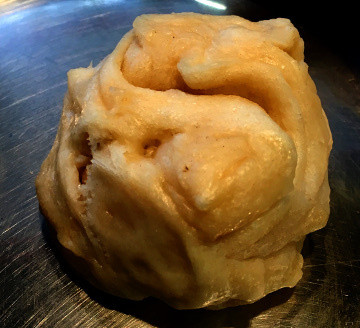 The poori bhaji was excellent–soft and buttery. Unfortunately, I devoured it before I had a chance to photograph it. Frankly, I ate too much, as I only realized waddling home.